Greek authorities have welcomed the recent statement of German President Joachim Gauck, who said that Germany should consider paying WWII reparations to Greece. "These things that the German President Joachim Gauck said are a contribution to the effort we make to heal the wounds of the past,” Greek Deputy Defense Minister Kostas Isihos said in a statement. "It is an answer to those who argue that our claims to Germany after World War II are directed against Germany. This is wrong,” he added. Isihos’ words were echoed in a statement from Zoi Konstantopoulou, speaker of the Hellenic Parliament. Earlier, President Joachim Gauck declared he understands Athens’ calls for WWII reparations, saying that Berlin should examine its historical responsibility to Greece. “We are not only people who are living in this day and age, but we’re also the descendants of those who left behind a trail of destruction in Europe during World War II – in Greece, among other places, where we shamefully knew little about it for so long,” Gauck told daily Suddeutsche Zeitung. Many Greeks blame Germany, Athens’ biggest creditor, for the tough austerity measures and record high unemployment they have faced after getting two international bailouts total worth €240 billion. 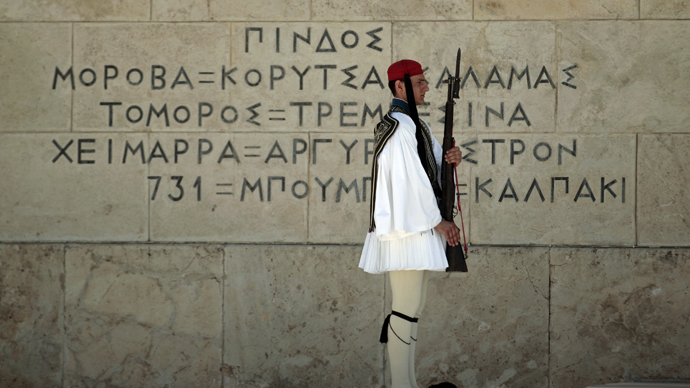 In April, Greece calculated that Germany owes it no less than €278.7 billion in World War II reparations. The sum, ruled by a parliamentary committee and the Greek Supreme Court, exceeds Greece’s total debt of €240 billion to the EU. "According to our calculations, the debt linked to German reparations is €278.7 billion euros, including €10.3 billion for the so-called forced loan. All the other amounts are related to allowances for individuals or infrastructure,” said the country’s deputy finance minister, Dimitris Mardas. Germany had repeatedly denied that it owes Greece any more money, saying it had already paid Athens war damages of $25 million in the 1950s, equivalent to $220 million today, and also paid out 115 million Deutschmarks (a sum worth around $230 million today), to victims of Nazi crimes in the early 1960s.